A new exhibition of stunning jewellery from medieval Poland has just opened at Down County Museum. The exhibition provides visitors with the opportunity to see an incredible range of artefacts made to an extremely high level of skill and quality and to learn more about Polish history and culture. 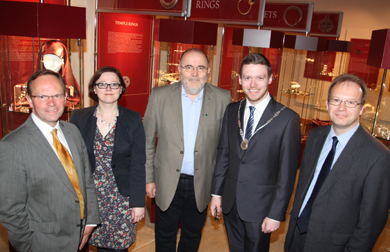 At the opening of the exhibition were Chris Bailey, Director of the Northern Ireland Museums Council, Anna Godlewska, Deputy Director, Polish Cultural Institute, Wojciech Brzezinski, Director of the Polish State Archaelogical Museum, Down District Council Vice Chairman Councillor Gareth Sharvin, and Mike King, Down County Museum Curator. ‘Treasures of the Middle Ages: Archaeological Finds from Poland’, a travelling display from the State Archaeological Museum in Warsaw, is at Down County Museum as a result of an on-going partnership between the two museums since 2007, which has included the regular exchange of exhibitions between the organisations. Jewellery on display in the exhibition includes bracelets, rings, earrings, buckles, brooches, pendants and necklaces. Items worn by the nobility were made from gold, silver, bronze and glass while other people often wore objects made from copper, tin and even lead. In medieval times the type of jewellery a person possessed often indicated their status in society as well as their wealth and this topic is dealt with in the exhibition. This exhibition, as well as detailing the different types of jewellery worn and its decorative and practical function, the exhibition shows the various processes involved in the making of certain examples of the items on display. This provides an insight into the sophisticated techniques of those who produced the jewellery. The exhibition also includes information on how the designs incorporated into the jewellery reflects the beliefs and culture of the time. Some pieces on show are associated with worship of the sun, moon or elements in nature and some designs are particularly associated with men or women. One of the highlights of the exhibition is the section on the Borucin hoard which was discovered in northern Poland in 1856. The objects found date to about 1050 and include a total of 36 objects, ranging from gold and silver beads to disc pendants, a ‘lunula’ or moon-shaped pendant, and an amulet case. Speaking at the opening event, Down District Council Vice-Chairman, Councillor Gareth Sharvin said: “This truly fascinating exhibition provides a rare opportunity to see such a fantastic collection of beautiful, medieval, European objects displayed together. 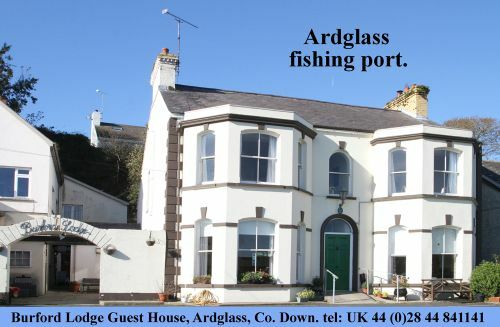 It is a welcomed boost to our tourism industry in Down District and it is sure to be a popular attraction this summer for a great range of visitors including local people, tourists to County Down and members of the Polish community living within the District. A number of events will accompany the exhibition including an ‘Archaeology for All’ day on Saturday 22 June and a series of children’s craft days to make necklaces and other items inspired by the display on 6, 20, 27 July and 3, 17 August. The exhibition is open daily and admission is free.